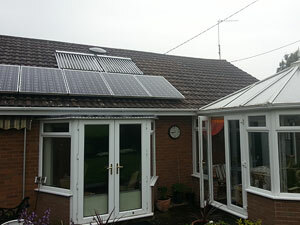 This was a 2 kw extension for Mr Jenkins of Orleton, Shropshire. Eden Power used 250w polychrystalline panels with an SMA Sunnyboy inverter. Mr Jenkins took our advice and sought 3 quotes and chose EdenPower because of a recommendation from his friend who also had a 4 KW solar system fitted by us. He also liked the fact that Eden Power took care of all the administration and paperwork for him.